It takes only a spark, from a lightning or human ignition, to start a fire, but it involves high temperatures, a period of drought, a build-up of dry vegetation and strong winds to start a bush fire, such as is devastating Queensland and recently California. When all these factors combine firestorms ensue, enhanced by strong winds from the hot interior of the continent, overwhelming the desiccated bush and human habitats. This is the face of global warming, which on the continents has reached an average of 1.5oC (see this). 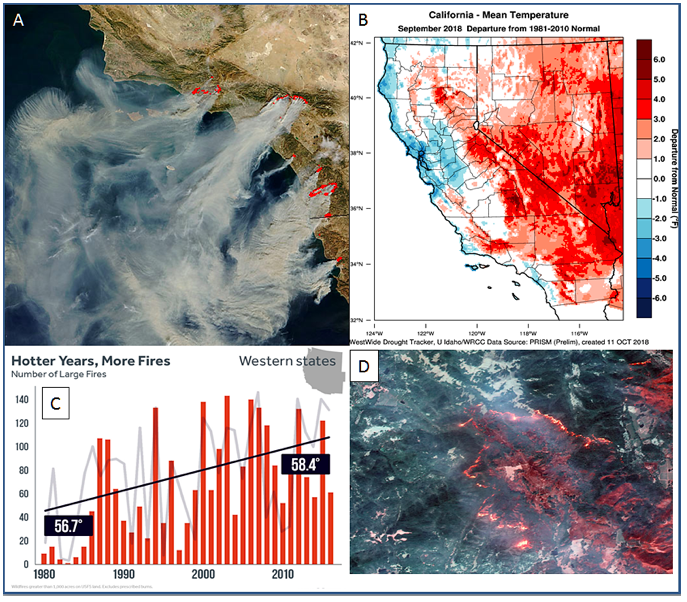 An overview of the cost of extreme weather events for the first half of 2018 (Figure 1A), prior to the California wildfires, estimates the cost as US $33billion. Some 3,000 people lost their lives in natural disasters during this period. The NatCatSERVICE database registered 430 relevant natural disasters in the first half of 2018, more than the long-term average (250) and the previous year (380). 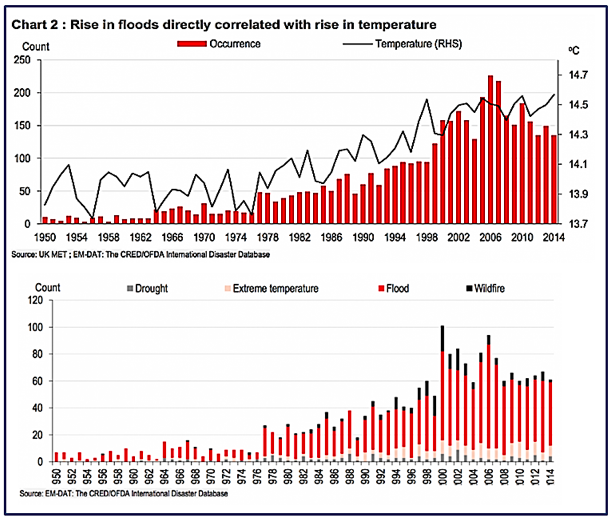 The rise in floods correlates with the rise in global temperatures (Figure 1B). An independent report in 2012 from the International study the human and economic costs of climate change (DARA) linked direct and indirect 250,000 deaths worldwide to climate change each year [see this and this] and is estimated to cost between $US 2-4 billion/year by 2030 [see this]. 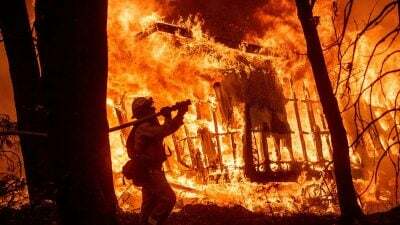 California: The 2018 California wildfires burnt the largest amount of acreage recorded in a fire season, as of 30.11.2018, causing $2.975 billion in damages, including $1.366 billion in fire suppression costs, becoming the largest complex fire in the state’s history. On August 4, 2018, a national disaster was declared in Northern California, due to the extensive wildfires burning. 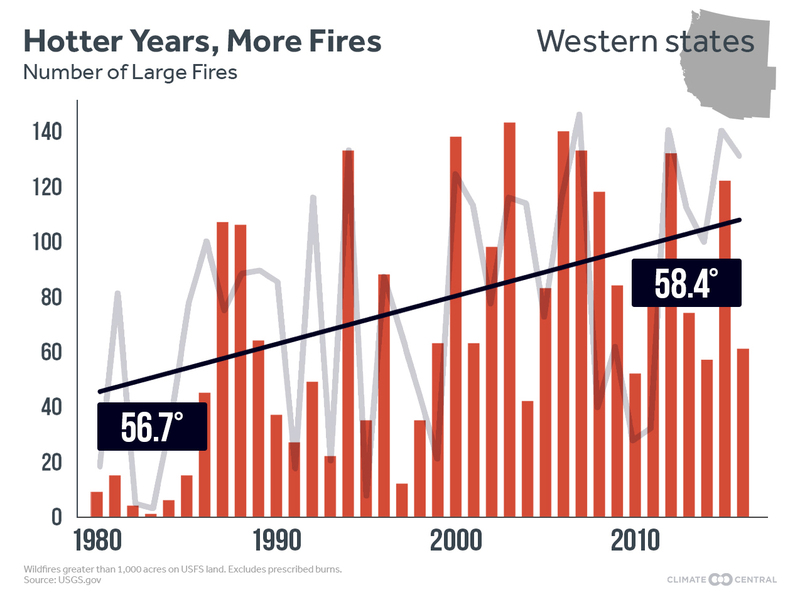 In November 2018, strong winds caused another round of large, destructive fires to erupt across the state, killing at least 88 and destroying more than 18,000 structures, becoming both California’s deadliest and most destructive wildfire on record (see this). With the continuing rise in global carbon emissions and temperatures, the fate of the world’s forests due to fires and logging is in doubt (see this and this). 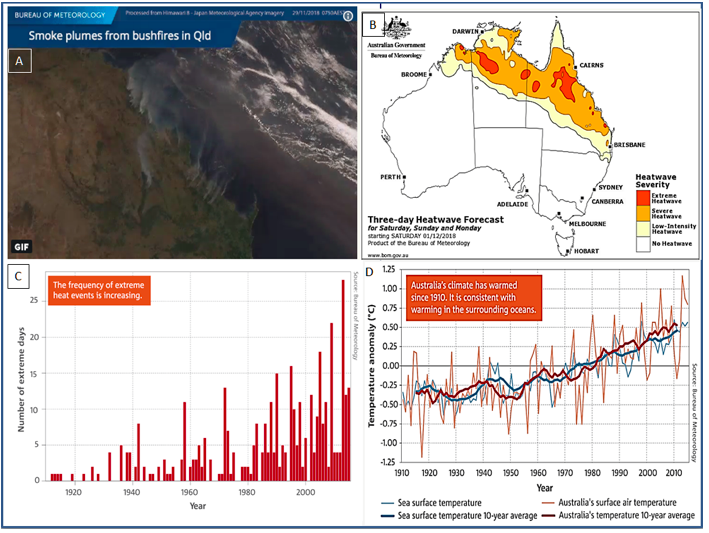 The correlation between the rise in catastrophic bush fires in California, Queensland and other parts of the world (Figure 1A) emphasizes the dangerous course the world is undertaking. The introduction of lumps of coal to parliament would hardly help (see this), nor would the opening of new coal mines in heat scorched Queensland where Adani has just announced the opening of a new coal mine (see this).